Depending on your time zone, the Moon enters Sagittarius sometime this afternoon or evening. When it does so, it immediately picks up the signal from Mercury and Venus, which are early in fellow fire sign Aries. This should ease the way for communicating with people you care about, even with seemingly ‘philosophical’ topics. 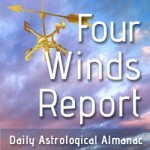 Welcome to today’s Four Winds Report. If you haven’t yet listened to Eric’s latest Planet Waves FM recording, do check it out — it’s a fascinating discussion of the schoolkids who are making themselves heard on gun safety, and of the astrology that sets them apart. Also new on our website: regular cartoonist Jen Sorensen satirizes toxic masculinity in this week’s comic. In terms of today’s astrology, Mercury and Venus make contact with three significant minor planets from the early degrees of Aries. Eric explores all three of these objects — Pholus, Quaoar and Salacia — thoroughly in The Art of Becoming. Here is a link to the resources area on that website; it’s packed full of information on these intriguing planets, and a good deal more besides. Today’s Birthdays: John Herschel (1792-1871), Luther Burbank (1849-1926), Madame Sul-Te-Wan (1873-1959), Maurice Ravel (1875-1937), Piet Mondrian (1872-1944), Milton Avery (1885-1965), G. I. Taylor (1886-1975), Anna Magnani (1908-1973), Betty Holberton (1917-2001), Kōbō Abe (1923-1993), James Broderick (1927-1982), Ranulph Fiennes (1944), Townes Van Zandt (1944-1997), Ernie Isley (1952), Bryan Cranston (1956), Taylor Dayne (1962), Wanda Sykes (1964), Rachel Weisz (1970), Laura Prepon (1980), Brandon T. Jackson (1984). Tonight’s edition of Planet Waves FM [play program here] is astrology-focused. Eric considers the charts of the young people finally moving the needle on gun control: the cohort born starting in 2000, what you might call post-millennials. This astrology contains two conjunctions that represent steps forward: the Jupiter-Saturn conjunction in Taurus, and Chiron and Pluto in Sagittarius. He briefly considers what people born in the 1980s and 1990s experienced astrologically, and then demonstrates the significant differences in charts starting in 2000. Moon Phase: Moon is in Waning Gibbous phase and enters Last Quarter phase on March 9 at 3:20 am PST / 6:20 am EST (11:19:42 UTC). Moon Sign: Moon is in Scorpio and enters Sagittarius today at 2:03 pm PST / 5:03 pm EST (22:02:45 UTC). Moon enters Sagittarius at 2:03 pm PST / 5:03 pm EST (22:02:45 UTC). — Mercury square Quaoar at 2:40 am PST / 5:40 am EST (10:39:47 UTC). — Venus square Pholus at 2:38 pm PST / 5:38 pm EST (22:37:30 UTC). — Venus conjunct Salacia at 6:51 pm PST / 9:51 pm EST (02:51:25 March 8 UTC). Though your sign is rarely obsessed with money, you will be well served to cultivate a healthy respect for building your wealth. You have the initiative; you have the motivation; and, most of all, you have a job to do. Align yourself with your truth, make yourself useful, and connect that to a business plan. Then stick with it for a year. Your chart is still reverberating from last week’s Full Moon in your opposite sign Virgo. The Sun is now at the midpoint of Pisces, and is still close to Neptune, which is providing you with energy and motivation. Depending on your time zone, the Moon enters Sagittarius sometime this afternoon or evening. When it does so, it immediately picks up the signal from Mercury and Venus, which are early in fellow fire sign Aries. This should ease the way for communicating with people you care about, even with seemingly ‘philosophical’ topics; you may notice a sense of optimism when it comes to discussing feelings. This might be going out on a limb, but even politically charged topics could be easier to approach — though discussion is likely to be quite spirited, and that window might be brief. With the Moon also making a challenging aspect to the bodies still in Pisces, you might notice an urge to travel or escape that could feel frustrating if you can’t indulge it. Remember that even a modest change of scenery within your neighborhood or giving yourself an hour to daydream could offer relief.